The U.S. Navy is evaluating a scaled-down version of the Surface Electronic Warfare Improvement Program (SEWIP) system for potential incorporation on future Littoral Combat Ships (LCS), Naval Sea Systems Command announced, Nov. 20. SEWIP is an evolutionary development block upgrade program for the SLQ-32 Electronic Warfare (EW) System and will be designated as SLQ-32C(V)6. Still in the early stages of development, its purpose is to provide LCS with an improved electronic warfare suite to improve the ship's defense capabilities. U.S. Navy installed the Lockheed Martin SEWIP Block 2 System on DDG-96 for operational testing over the summer. "This system is another example of the close partnerships to deliver a tremendous improvement in warfighting capability to our Sailors," said Capt. Doug Small, major program manager for Above Water Sensors (PEO IWS 2.0). "By maintaining commonality with SEWIP Block 2, we are able to simultaneously reduce life-cycle sustainment costs for the fleet." 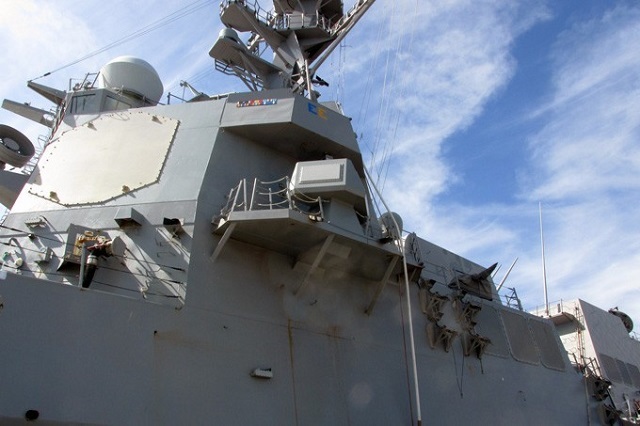 Upgrades to the antenna, receiver and combat system interface allow the SEWIP system to pace new threats; improve signal detection, measurement accuracies and classification; and mitigate electromagnetic interference. AN/SLQ-32(V)6 provides enhanced electronic support capability that allows better detection of current threats. The SEWIP Block 3 will include improvements for the electronic attack by providing integrated countermeasures against radio frequency-guided threats and extending frequency range coverage. The Block 3 will be installed on surface combatants that have the existing active version of the SLQ-32. An at-sea demonstration to test the effectiveness of the system's capabilities on LCS is scheduled for December 2014 aboard USS Freedom (LCS 1) off the coast of San Diego. In September this year, the U.S. Navy awarded Lockheed Martin an additional $147 million contract to upgrade the fleet’s electronic warfare defenses against evolving threats, such as anti-ship missiles. Under this low-rate initial production contract for Block 2 of the Navy’s Surface Electronic Warfare Improvement Program (SEWIP), Lockheed Martin will provide 14 systems to upgrade the AN/SLQ-32(V)2 system on all U.S. aircraft carriers, cruisers, destroyers and other warships with key capabilities to determine if the electronic sensors of potential foes are tracking the ship. Block 2 is the latest in an evolutionary succession of improvement “blocks” the Navy is pursuing for its shipboard electronic warfare system, which will incrementally add new defensive technologies and functional capabilities. In 2013, Lockheed Martin was awarded 10 systems as part of low-rate initial production, which the company is now in the process of delivering to the fleet. In July, the Navy installed Lockheed Martin’s SEWIP Block 2 system on USS Bainbridge (DDG-96) for operational testing.